Read Chapter 9 of Inner Christianity, on Love, Evil, and Forgiveness. Copy and paste the questions below to a new e-mail, insert your answers and send to the Mystery School with the following subject line: InnerChris 9 from ___________ (Your name). 1. What Bible verse suggests the origin of evil? 2. In what book of the Bible do we see a supreme statement of this mystery? 3. What is the fifth dimension of the universe (no, not the singing group!)? 4. Through our ___________ _________ to know _______ and _________, we chose to leave our ___________ ___________ and sink down to one that borders on the __________ ______________. 5. 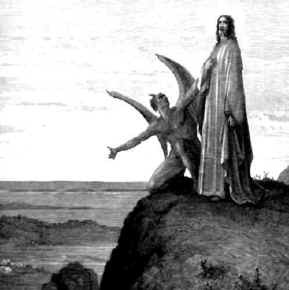 What does the Hebrew word "Satan" mean? 6. Satan is part of the ____________ ________________. 7. What is the most fundamental law of the universe? 8. What is the law of karma? 9. What is the Greek word for karma? 10. How can we escape karma? 11. What are some things people do instead of forgiving? 12. What is the principle reason forgiveness is difficult? 13. What perpetuates the human condition of conflict and suffering? 14. What is the chief tool needed to truly forgive? 15. The ultimate sacrifice we have to make is that of ________ _________. 16. What are the four Greek words for love? What do they mean? 17. How can we boil these down to two? 18. What are the characteristics of agape? 19. T/F It is possible to have agape love in all our relations without having to cut ourselves off from others. 20. Esoterically, what are two people called who God has joined together?